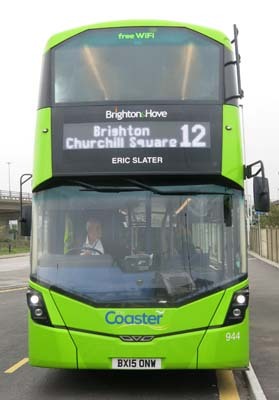 Connections with Brighton and Hove : Eric Slater was an artist who lived for most of his life in Seaford. He had an international reputation in the 1930s but died in obscurity. Now, after a book and a series of exhibitions, his work is enjoying a revival. There is a Slater Trail, a two hour walk to places associated with him. He specialised in colour woodcuts, a form of printmaking based on Japanese techniques. He exhibited in Brighton, Eastbourne, London and abroad. Born in 1896, he moved from London to Sussex and attended the Hastings School of Art. A neighbour called Arthur Rigden probably taught him how to make woodcuts. His woodcuts were less formal that Japanese ones and become popular in many countries, especially the USA. They were marketed as affordable work for ordinary homes. He exhibited his art widely but changing fashions and the Second World War led to a decline in his popularity. He died in 1963 and was buried in a shared grave at Seaford. But art lovers have since rediscovered his work and it is again highly collectable. This time his reputation is unlikely to fade again. 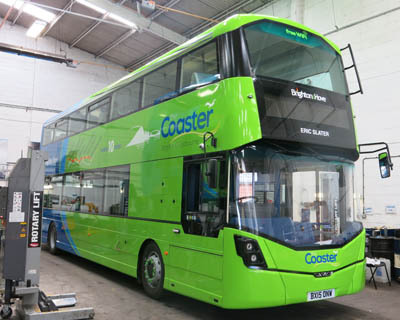 944 Mercedes Streetdeck - carried name since delivery in April 2015 on Coaster Route 12.